There is this running joke online that the year 2016 was horrible. Sure, lots of famous people seem to have died (anecdotal) and there is a general uncertainty about the future (trump). However being an optimist, I think it's important to remember that the word is still getting better. In fact, the world is better than it has ever been. Worldwide poverty is in a free fall. Child mortality rates are too. 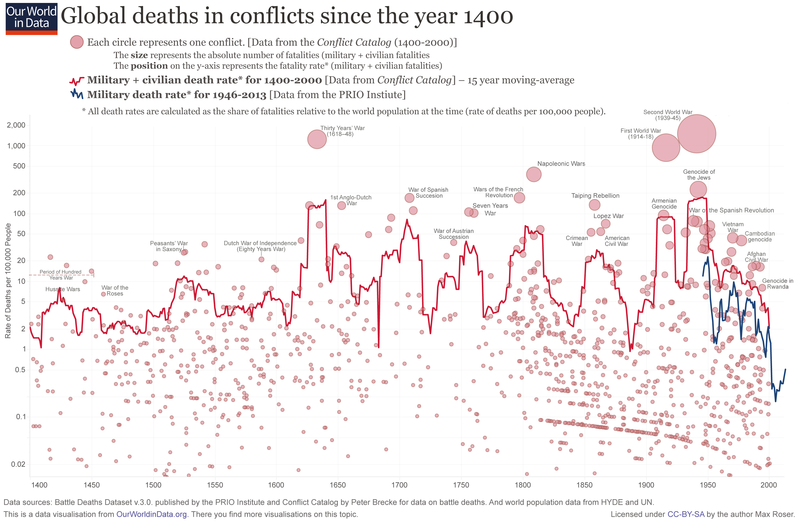 Although there is a rising global fear around terrorism, conflict-related deaths are just about as low as they have ever been. And on a really positive note, almost half the world is online. With no sign of the progress slowing down. Continuing on that positive note, albeit on a much smaller scale, I've personally had a great year. Of the 5 resolutions I set for myself this year, I've completed 4 of them. With the 5th hopefully being completed soon... I know mysterious. I never wrote those resolutions with the intention of sharing them. But this year I'm going to, my next post will contain my resolutions for 2017. All the charts here are from ourworldindata.org, I highly recommend this article on their site about why most people think the world is getting worse and how they are wrong. It's really cool to see all the consumer products that techstars has played a part in bringing to life, all in one place. Awesome job, Mitchell Cuevas putting the list together! Last night I attended a Jeffersonian style dinner hosted by a couple of friends Nick Karas and Matt Conforti who both work at Flux here in Boulder. The idea of a Jeffersonian dinner is that the dinner conversation has a preset topic that everyone should come prepared to talk about. The topic for last night's dinner was "Who has been the most effective teacher/mentor in your life? Why did they leave a lasting impact?" There was a wide range of answers. From, basically not having any specific mentors rather considering a friend group as the closest thing. To having very deliberate mentors where the relationship of mentor to mentee was verbally discussed. Also, through the course of the evening, we were able to hone in on a more specific definition of what a mentor is. We discussed the distinction between a mentor, role model, and a teacher. A teacher is the easiest to define, someone you learn from either with direct contact or not. A role model is someone you look up to and want to become similar to in some or many ways. Finally, a mentor can be both a teacher and a role model. The difference is basically the element of friendship and a good mentor takes some ownership / responsibility in the growth of the mentee. A word that kept coming up around mentors was human. Many people in the group described that their mentors first saw them as a human. Meaning they were much more tolerant of mistakes and treated them with kindness. Over the past few years since graduating college, I have been very lucky to have had many great mentors. Including Ted Serbinski who taught me the value of giving time to others, a value embodied by Techstars slogan: Give First. And Jason Mendelson whom I picked up the importance of being as kind as possible regardless of who that person is and how busy my own life might be. Those mentors, among many others, have been highly influential in my life over the past few years. However, I would be completely wrong if I had picked any of them as my most influential mentor overall. My answer to that question is indisputably my father. While I was growing up my father was always an entrepreneur. In the late 90s, he started a tech company. And after that, he has run a commercial bakery and been very involved in charitable work. He has always advocated working hard, building things, and that no problem was too difficult or impossible to solve. In addition to being a great teacher and role model, my dad has certainly been the mentor that has left the biggest lasting impact in my life. Thanks, dad! Finally, thank you again Nick and Matt for hosting all of us for dinner. Hope to do it again! Moving to a new place is hard. It means starting over in a number of ways. Including making new friends, learning the local area and finding new places to hang out. Daily habits are also retooled. If used thoughtfully moving can be a great opportunity to reshape some of those habits in positive ways. Exercise. In Michigan, I would exercise about once every two weeks. Here I've been in the rhythm of running or hiking about 3 times per week. Reading. My regular reading cadence was about 2 book/yr. Since moving, I've finished 5 books and next year I'm setting a goal of reading 25 books. I'm a pretty slow reader but am really enjoying it. Happiness. Which is not really a habit, but arguably the result of habit. My happiness has been (mostly) up since September 17th when I moved. I set up a recurring reminder to meet at least one new person every week. My normal method of doing this has been reaching out to someone just outside my network and asking them to grab lunch. At the end of the meeting, I always ask "If there is one person in town I should definitely meet, who is it?" And then follow up with "Will you introduce me?" This is surprisingly effective, and often even ends up in multiple introductions. If I keep this up I will know over 50 people by September next year. Networking events. As an introvert, I really dislike them generally. However, they are a great way to meet like-minded people. In a small town, it's also a great way to keep up with other people that I've met a couple times in passing. If anyone has other thoughts or tips on transitioning to a new place I would love to hear them!